Charge the microscope for 90 minutes with the supplied USB cable and power adaptor. Alternatively, you may charge the microscope using the supplied USB cable from any powered USB port. The microscope's charge indicator will turn red while charging. Note – The microscope can also be used while charging. Insert the provided 8GB micro SD card into the microscope's micro SD card slot*. The SD card must be installed to store captured images when in WiFi operation mode. For Android: Download MicroCapture for Android. For iOS: Download MicroCapture for iOS. Turn the microscope's power switch to the WiFi position. Under your device's WiFi settings, select the WIFI_Microscope_xxx network and enter the default password: 12345678. Launch the MicroCapture app on your device and the microscope should automatically connect and display an image. 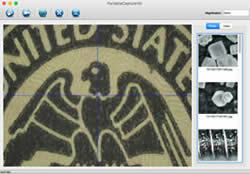 You may select either the Still Camera or Movie Camera icon to choose between movie recording or still image capture. Capture an image (or video) by tapping the center Capture Button icon. Tap the Library icon to download pics stored on the SD card to your device. Tap the Settings cog icon to change default image and movie capture properties. For Windows: Install MicroCapture HD from the supplied CD. For Mac: Install PortableCapture HD from the supplied CD. Plug the supplied USB cable into the microscope and then into a USB port on your computer. Turn the microscope's power switch to the USB position. Launch the MicroCapture HD (Windows) or PortableCapture HD (Mac) application and begin using. * While the micro SD card is installed in the microscope, the microscope operates as a USB card reader for transferring images directly to your computer and does not operate as a USB microscope when in this state. Please eject the micro SD card before using as a USB microscope. If the microscope becomes unresponsive for any reason when switching between operational states, a recessed reset button can be found on the side of the microscope. Use a paperclip to reset the microscope to factory settings.